“Intelligible Design” or Intelligent Design or Creationism; what is World Scientific playing at? Update July 29: World Scientific asked me for a full review of the book. I have sent it to them, with a cover note saying that I hope never to have occasion to publish it. All that fine invective, never to see the light of day! But fair’s fair. From Louisiana through the Discovery Institute to Glasgow, examples of the creationist obsession with Darwin (and inability to quote him correctly) continue to accumulate. And now here’s the bit that’s relevant to my theme, courtesy Zack Kopplin. To quote Sen. Nevers, the Louisiana Family Forum “believe that scientific data related to creationism should be discussed when dealing with Darwin’s theory.” So there are scientific data relevant to creationism (what, I wonder? ), but a century and a half of evolutionary science are merely “Darwin’s theory”. As in, the Earth goes round the Sun in an elliptical orbit is “Kepler’s theory”, and stuff is made out of atoms is “Dalton’s theory”. Stephen Meyers’ Darwin’s Doubt uses similar tactics, from the title on in. The contents give us three references to Darwin in its 23 chapter and section headings; “Darwin’s Nemesis”, “After Darwin, What?”, and “The Post-Darwinian World and Self-Organisation”. Darwin’s name also occurs seven times on the book’s front flap. This (free view on Amazon) presents one short argument, to introduce one very long book, based on compressing the Ediacaran and Cambrian radiations, ignoring everything we know about the events leading up to them (see Robert Hazen’s Story of Earth for a good brief overview), and comparing the resulting mystification with the problem of the origin of life. 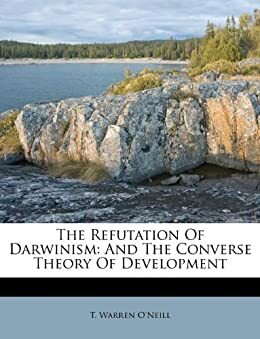 The index gives ten subheadings and 21 page references for Darwin, and sixteen subheadings and 43 page references to “Darwinian evolutionary theory”. These include six to “Agassiz’ challenge”; that’s Louis Agassiz, who was generously acknowledged by Darwin for his discovery of the Ice Ages, and died 1873. And I nearly forgot: twentysix subheadings and 38 page references for “neo-Darwinism”. For comparison, Carl Zimmer and Douglas J. Emlen’s Evolution; Making Sense of Life (one of the few textbooks I have come across that is actually a pleasure to read) has 16 subheadings and 33 page references to Darwin. And for “Darwin’s theory”, “Darwinian theory”, or “neo-Darwinism”? None at all. Indeed, I cannot recall when I last came across those expressions, other than from a historian or a creationist. And of course Glasgow’s own Centre for Intelligent Design, a Discovery Institute echo chamber, has done its poor best to support Stephen Meyer. How? By mangling Darwin to totally shift his emphasis, and refocus it on Meyer’s chosen pseudoproblem. You will find the full gory details here on my friend Robert Saunders’ blog, Wonderful Life. There is also more about Meyer’s book on the BCSE website; I discussed it here, but think Nick Matzke’s dismemberment may be impossible to improve on. Disclosure: I lectured about “Dalton’s theory”, though I didn’t call it that, to Alastair Noble, now the Centre’s Director, many years ago. I like to think my teaching has improved since then. But at least I wasn’t responsible for teaching him about biology, or geology, or complex systems theory, or elementary logic, so perhaps I shouldn’t blame myself too much for what he’s been up to since. Don’t say “Darwin” when you mean “evolution”. It’s about as useful as saying “Dalton” when you mean atoms. Our understanding of atoms has moved on enormously since Dalton’s time, and our understanding of evolution has moved on similarly since Darwin’s. Neither of them knew, or could have known, the first thing regarding what they were talking about, and both would be delighted at how thoroughly their own work has been superseded. Dalton didn’t know anything about the forces that hold atoms together, which depend on electrons and quantum mechanics. In fact, he didn’t even know about electrons. Darwin was equally ignorant about the nature of biological novelty, which comes from mutating genes. In fact, he didn’t even know about genes. Chemistry has advanced enormously since Dalton, just as biology has advanced enormously since Darwin, although atoms remain central to chemistry in much the same way that evolution remains central to biology. And while we’re on the subject of unhelpful language, don’t say “theory of evolution” when you mean the well-established facts of historical and continuing change over time, and of common ancestry. And if you find yourself in the position of explain the difference between a scientific theory (coherent intellectual structure developed to explain a range of observations), and the use of the word “theory” in everyday use (provisional hypothesis), you have blundered into a morass. Back out again. But back to Darwin. You can see what I mean if you just look at the names of the books written by the new enemies of scientific biology, from Darwin’s Doubt (Meyer, 2013) all the way back to Darwin’s Black Box (Behe, 1996) and beyond. This week I came across further examples, The Darwin Conspiracy (Roy Davies, 2006), which portrays Darwin as a plagiarist, and, while checking its details, an even more lurid book of the same name by John Darnton, which portrays him as a murderer. To be fair, Darnton does not pretend that he is writing anything other than fiction, although surely he was writing with half an eye on the creationist market. There are also references to “materialist neo-Darwinism”, but since I don’t pretend to know what a “materialist” is, and whether I or for that matter Darwin would qualify, I decided to let that go. Some time, you may want to start a conspiracy theory. If you want to learn how to do this, you cannot do better than study the antics of the creationists, and especially their Discovery Institute (DI) think tank. Creationists absolutely need to have a conspiracy theory. That is because their position contradicts everything that scientists have been telling us for the past 200 years, or even, in its Young Earth version, the past 300 years. If creationism is true, the entire intellectual establishment has been lying to you. All conspiracy theories work the same way. Like the most unpleasant kinds of religion, they divide humanity into two groups, the illuminated and the benighted, and offer membership of the illuminated, if you will only accept their central doctrine. To qualify as a conspiracy theory, that doctrine has to pour scorn on the most obvious or scientifically validated explanations of the facts, and replace them with the belief that these explanations, or indeed these facts, are fabricated by a close-knit group of wicked people (in this case, the Wicked Evolutionists, or WE), cynically manipulating the evidence for their own disreputable reasons. Once this belief is in place, it is self-sustaining, since all evidence to the contrary is tainted, coming as it does from the Unscrupulous Scientists (US). The next step in setting up your conspiracy theory is to find a group of people who already want to believe you. Most of us, after all, spent most of our thinking time in looking for evidence in favour of what we want to believe. So find a group of people who already have reasons to want your claims to be true. They might, for example, wish to believe that the Government is hiding evidence of UFOs, or that NASA is a giant scam, or Barack Obama should not be President of the United States, or that Government should not interfere with the operations of industry. Then give them an excuse, however flimsy, for believing. Believing that aliens landed at Roswell, or that the Moon Landings were faked, or that Obama was born in Kenya, or that there is no such thing as man-made global warming. Or, at least, for believing that the topic is controversial. If all else fails, your own voice raised in denial of reality can be used as evidence that the controversy is real. You’ve now got US in a cleft stick. If WE ignore you, you can continue unchallenged. If WE reply to you, that proves that there really is a controversy. And if WE try to explain that there is nothing worthy of a reply, you can claim, as William Lane Craig claimed when Richard Dawkins refused to debate with him, that WE are scared of you. Time to illustrate by example. And a good example it is; the DI members are really very good at what they do. This one comes from the cover letter that the Discovery Institute recently sent out with its pamphlet for parents, A Parent’s Guide to Intelligent Design. My excuses for publicising here are that it is going to reach its target audience without any help from me, and that this particular example is in fact rather instructive. I take a perverse pleasure in showing ways that we can learn, from creationist materials, what the creationists themselves refuse to learn. Textbooks and teachers stop teaching myths about evolution when the mainstream media admit textbooks are wrong … don’t they? Not if the data challenges Darwinian evolution. The evidence challenging evolution is beginning to outweigh the evidence that supports it. But will your kids learn about that in their science classes? Unfortunately, probably not. To help parents understand all the aspects of the debate over Darwinian evolution and intelligent design we created a free 28 page e-booklet A Parent’s Guide to Intelligent Design: Resources to help you and your children understand the debate between Darwinian evolution and intelligent design. The free booklet comes with a request to donate, but whether that Discovery Institute really needs that money, or whether it is just another device to generate commitment, we can only speculate. Let’s look first at the overall structure, and then at the specific claim, (which is actually one of four; but life is short). Now to the substance of the claim I’m examining, that the textbooks are “Retelling outdated myths about the Miller-Urey experiment and the origin of life and wrongly telling students the experiment correctly simulated gases present on the early earth.” 30 years ago, this claim might have had some validity, but not now. No matter. Once a claim enters the creationist literature, it takes on a life of its own. For example, Darwin’s lament about the incompleteness of the fossil record in 1859 is repeated as if it described the situation today, despite the existence of tons (literally) of evidence unearthed (literally) to the contrary. So let’s look at what actually happens in the Urey-Miller experiment, what it does or does not tell us, and how it is treated in 21st-century textbooks. The original report of the Urey-Miller experiment relates it to Harold Urey’s cold accretion theory, which maintained that the planets formed so slowly that the gravitational energy of their formation was dissipated as heat. On this theory, the metal from iron-nickel meteorites would have been lying around on the Earth’s surface giving rise to a strongly reducing (i.e. hydrogen-rich) atmosphere. This theory did not survive the moon landings, and the discovery that most of the moon’s surface consisted of molten basalt. Nor does the experiment address the origin of biological polymers, or of organisation. Nonetheless, the experiment was, and remains, liberating. It destroyed the assumption that the building blocks of life are difficult to come by. Changes in thinking since then have all been in the direction of making the production of these molecules seem easier. As Stanley Miller himself showed in one of his late (2002) papers, we don’t need a strongly reducing atmosphere. We certainly don’t need ammonia, the least plausible of his original ingredients because it is so readily destroyed by UV light, as long as we have nitrogen, N2, (which we certainly would have) and some source of energy powerful enough to split it into separate atoms (and we would certainly have had that, in the form of the Sun’s unfiltered UV light, back before the formation of atmospheric oxygen and ozone, as well as lightning). We don’t need large amounts of methane. Very small amounts, which could readily arise from geochemical processes (as seems to be happening on Mars), would do the trick, as would carbon monoxide, a component of volcanic gas; it was carbon monoxide that was used in Miller’s 2002 work. Organics could also have arisen by completely different pathways, including reactions at hydrothermal vents, or on sulphide mineral surfaces, and large amounts of organics would in any case have been brought to earth by comets. Comets, after all, are dirty snowballs. The snow is thought to have made a major contribution to the Earth’s oceans, and the dirt is a mixture of organic compounds. Simple organic molecules are a precondition for life as we know it. We do not know the relative contribution of the various possibilities to the inventory of such molecules on the early Earth, but we can feel confident that they were there – one way and/or another. What about the textbooks? What do they say, what should they be saying, and how much justice, if any, is there in the Discovery Institute’s accusations? It’s absolutely true, of course, that the strongly reducing atmosphere Miller and Urey used for their first experiments is now not thought to be indicative of the primitive earth. Therefore, it would be a mistake to claim that these experiments “proved” anything about the actual biochemical pathways to life on earth. However, these experiments were still absolutely essential in shaping our current views of prebiotic evolution. Exactly. Urey-Miller demystified the production of the building blocks of life. For some decades, there was rancorous disagreement between those who paid high regard the original experiment, and the geochemists to whom such an atmosphere seemed increasingly implausible. However, once it became clear that the highly reducing atmosphere was no longer even necessary, the dispute faded into the background. I have looked at half a dozen textbooks. One of them did in fact present the Urey-Miller atmosphere as realistic, which I regard as gross professional incompetence, rather than the deliberate concealment suggested by the creationists. However, even this text did mention reactions at mineral surfaces as an alternative. Every biology textbook that I have examined, with one exception, makes it clear that finding a possible source for the building blocks is not the same as explaining the origins of life. The exception is the 2012 text Evolution – Making Sense of Life, by Carl Zimmer and Douglas Emlen, which presents the isotopic and fossil evidence for Archaean life, but says nothing about its origin. And indeed, why should it? We don’t demand that a chemistry textbook gives an account of the origin of the atoms, nor could it possibly have done so during the 150 or so years between when Dalton put forward the first version of the modern atomic theory, and when Fred Hoyle and co-workers gave the first good account of the origin of elements heavier than helium. So rest assured that your children’s textbooks will not retell “outdated myths about the Miller-Urey experiment and the origin of life”, but will, on the contrary, carefully distinguish between the formation of prebiotic organic molecules, and the origin of life itself. And even the few texts that are still guilty of “wrongly telling students the experiment correctly simulated gases present on the early earth” are careful to make this distinction. And the Discovery Institute is doing what they always do superbly. Distorting reality. This post may be freely reproduced in whole or in part for non-commercial purposes. Don’t say “Darwin” when you mean “evolution”. Don’t say “theory of evolution” when you mean the established historical facts of change over time and common descent. And above all, don’t say “Darwin’s theory of evolution” except in the historical context of the evolution of ideas. If you do, you are guilty of scientific, logical, historical, and pedagogical errors, and playing into the hands of our Creationist opponents.